The internal dosimetry program conducts analyses and consultation for the study and management of internal radiation exposure. The analyses include collection of information on work and residence history, past and current radiation exposure, bioassays to measure the presence of radionuclides within body tissues (in vivo) or body fluids and excretions (in vitro), and calculation of dose associated with observed uptakes. Consultation includes interpretation of bioassay results and can extend to collaboration with health care professionals and workplace supervisors. The internal dosimetry program includes a documented quality assurance program for in vivo bioassays and a comprehensive technical basis for the assessment of internal exposure. The program meets the requirements and recommendations of the DOE Implementation Guide for Internal Dosimetry Programs (10 CFR 835) and the American National Standards Institute Performance Criteria for Radiobioassay (N13.30). The Center is also involved in the DOE Laboratory Accreditation Program for internal dosimetry and radiobioassay. The internal dosimetry program is provided as an outreach service to the public to support education about the Center’s environmental studies and naturally occurring radiation, and to provide assessment of potential exposure to radioactive contaminants of concern. The program also provides support to the WIPP by conducting bioassays for radiation workers on a routine basis. Full-spectrum dosimetry services are available to evaluate internal radiation exposure to radiation workers and members of the public in the case of an accident at the WIPP. In addition, internal dosimetry services can be provided to other entities that employ the use of radioactive materials. 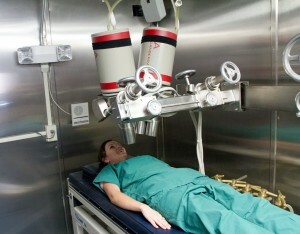 In addition to providing services in bioassay, staff of the internal dosimetry program carry out basic research in radiation detection technology and novel applications of in vivo bioassay techniques to environmental studies. The staff of the internal dosimetry program are also responsible for the Center’s radiation protection program to ensure compliance with the Center’s Radioactive Material License, granted under the authority of the New Mexico Environment Department.